Starring Carina Lau (劉嘉玲), Mark Chao (趙又廷), and Angelababy, Tsui Hark’s (徐克) upcoming fantasy-adventure film Young Detective Dee: Rise of the Sea Dragon <狄仁傑之神都龍王> is due for a September 27 release in Hong Kong. The film about the Tang Dynasty detective Di Renjie serves as a prequel for Tsui Hark’s 2010 film Detective Dee and the Mystery of the Phantom Flame <狄仁傑之通天帝國>, which starred Andy Lau (劉德華) in the title role. 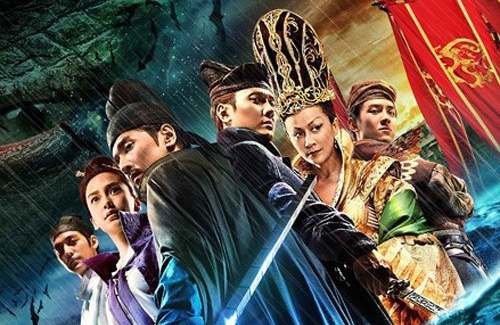 At a recent press interview, Tsui Hark discussed the difficulties behind filming the Mandarin-language film, and revealed that the film’s underwater action sequence that took 96 days to shoot was particularly memorable for the cast and the crew. The actors spent six hours underwater in total. The underwater scene was especially difficult for Mark, who had to fight submerged in water. Due to the high water pressure, Mark’s nose started bleeding halfway, but to not impede the filming schedule, Mark insisted to continue shooting. Although Mark professed that he is a swimmer, having his hands and feet tied underwater was a completely different “swimming” experience. With mixed German and Chinese heritage, Angelababy’s ethnical background attracted Tsui Hark to cast her as Yin Yuji, a courtesan who has an affair with the young tea house master Yuan Zhen, portrayed by South Korean actor Kim Bum. The underwater scenes employed a series of fantasy sequences. While Mark had to fight underwater, Kim Bum had to kiss the sleeping Angelababy. Mainland actor Lin Gengxin (林更新), who portrays the medic Shatuo Chung, was required to ride on a galloping horse underwater. Young Detective Dee: Rise of the Sea Dragon also stars Feng Shaofeng (馮紹峰) and Hu Dong (胡東), with a guest appearance by Chen Kun (陳坤). After its September 27 release in Hong Kong, it will open in theaters in mainland China and Singapore on September 28. Honestly, I find the reason the director chose Angelababy very laughable. The biggest reason she was chosen is because she’s marketable and she had a skilled surgeon. It has nothing to do with her mixed heritage because if she looked anything like she did before her surgery, she’d still be mixed and much less attractive. Interesting though how the director chose a Korean to portray a Chinese character and a Chinese to portray a Korean character. And why should they? They have a large group of actors they can choose and I do think they always prefer their own mainly due to nationalistic preferences. Zhang ZiYi played the part of Princess Bu-Yong in the 2001 Korean movie The Warrior and she was not even a big name then. Let face it, The Chinese want a piece of the Korean industry because of their huge popularity across Asia while Koreans want to dig their heels into the world’s second largest movie industry. You may see a Chinese actress in a Korean movie probably once every two years but most directors in Korea probably feel their movies will sell themselves due to their local actors popularity. I agree with Evie about the reason that he chose Angelababy. What, she has mixed German and Chinese heritage?? I have never heard of that. Is it because people are fooled by her fake and plastic face??? She look mix even before surgery, just not as pretty. By the way I don’t doubt that she is plastic. But do you know where I can get a before surgery photo? Just google. Her teeth is obvious. The rest are polished here and there. Yes she has done work. But how can any done work mean she has mixed German and Chinese heritage? Why German? Maybe that is the truth which explains why she looks weird pre surgery. what is so shocking about marketability playing a role in casting decisions? LOL!! Look, Tsui Hark obviously wanted to cast a HK actress as the female lead here for whatever reason, and besides her, there weren’t much to pick from he obviously did not want to scrape the bottom of the barrel by considering the inept TVB circus troupe. Not sure why I sounded like I was shocked to you but I was only stating the truth because I felt his reason was much too absurd and wanted to point it out. The director chose angelababy because he had no taste and no keen eye for talent. Tsui hark is past his prime, gone are his Wong Fei Hung days, he bombed very poorly in his Hollywood fare, and his movies in China like ‘Detective Dee’ are not up to mark or quality. I still cannot understand how Carina Lau can win the best actress award in this movie, she is just playing her natural self, strong, stubborn, domineering, so what’s new? No breakthrough acting, definitely not worthy of the award, and in a floppy film like this too. i don’t want to watch this movie simply the title nowadays really irks me!! Rise of the sea dragon? oh please! stop giving alternate name just go with young detective dee 2 or something! I have zero hope for HK movie industry. it just laughable!